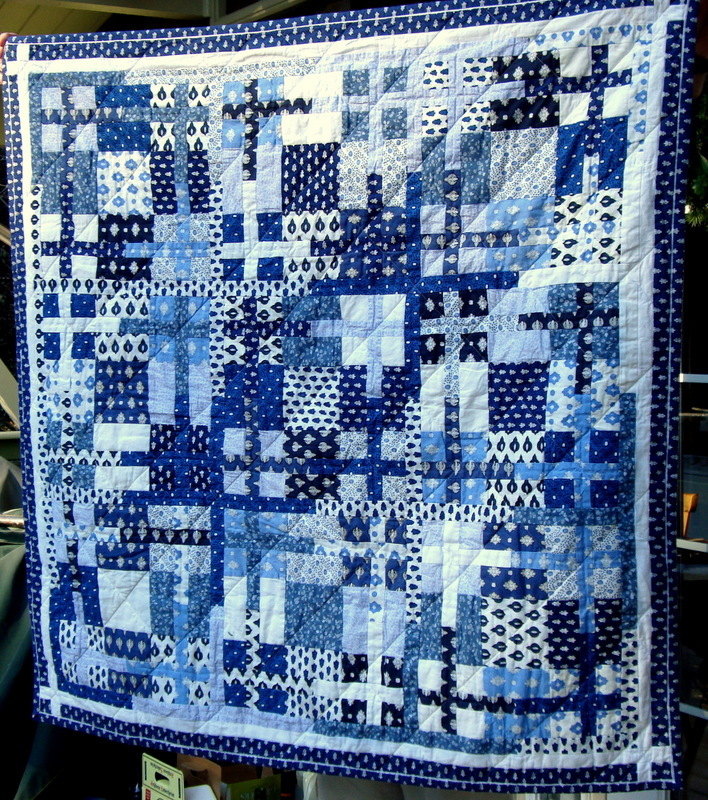 Does anyone know of other quilts that look complicated but are actually fairly easy to make? Do aTwister quilt! They are addictive and are easy to make. There's various ways to do the disappearing 9 patch, the 10 minute block, which looks like the Cathedral Windows, but is a whole lot less time consuming, I would also suggest going to Quilter's Cache. She has tons of free patterns. I am new to quilting also. 6 months now. I am working on "Winter Stars" (www.FonsandPorter.com). Look under their $5.00 downloadable patterns. It looks difficult, but with the use of their templates, a piece of cake. I took the opportunity to try my hand at making plastic templates. I went to ACE Hardware and bought a plexiglass cutter and, using an old piece of plexi, cut the templates. They work great. Hope you like the pattern as much as I do. Is there a doctor in the house? I just got bit by the quilting bug! My favorite really easy quilt is called "Weaver Fever" , it goes together really fast . Last edited by Lori S; 02-25-2012 at 06:38 AM. Go Twister fun and you get addicted and can make so many patterns. I've never seen Weaver Fever but I like it! Thanks for sharing the link. I've made the Weaver Fever quilt and it is easy to do. Thank you for the links, they are great!!!! go back to the old standards, 9 patch, 4 patch, 5 patch. Most are HST, sometimes with solid squares. You can enlarge them to make one block the center section on a big quilt. One of my favorites that shows up here quite often is the Carpenter's Wheel. It's HST and solid blocks and looks wonderful as a lone center block. This is nice - it looks as though some of the blocks are floating ! OBW's are really easy. Six pieces to cut for a block. I think this is the quickest method to make a top. Some folks disagree, but that the arrangement part of the blocks, I think - they just can't decide on the placement right away. The french braid looks difficult, but is very easy once you get started. I don't have any suggestions for blocks to make, but love this pattern. I saved it to try. Looks like fun. Thanks a bunch for posting it. If I see something later, I'll post it. Thanks for the great idea, I never even thought of purchasing a plexi glass cutter. Will have to check it out at my local Ace Hdw. Did you purchase the plexiglass there also? What is a OBW block? Square dance=twister. Original name by Martha Thompson was Square Dance. It's an old Moda pattern but I used slightly different sized Provencal print squares I'd got at a quilt show and other bits and pieces from my stash to make a quilt for my mum who loves blue and squares. Easy but looks complicated. BQ3 is super easy and super fast. I'm partial to Bento Box (my avatar). It's 2.5" strips cut into just 3 lengths. All you need is one background color (I used white) and your color choices. It goes together in one day (if you can stop yourself from constantly rearranging). My avatar quilt is made from bright Asian fabrics, but I've also made it in pastel chintz and solids. Warm Wishes is also very easy. I think there is a tutorial on this board.